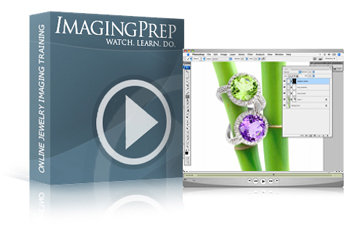 This full project includes retouching a gemstone ring, managing colors to create multiple stone variations, choosing a prop, and placing and styling rings on the stock photography prop in Photoshop. In this chapter we cover photographing loose diamonds. For this setup, we complete the project using "hot lights", light modifiers, a Canon 30D, and Photoshop. This is a complete project chapter, and covers all steps involved in photographing, lighting, and retouching loose diamonds. 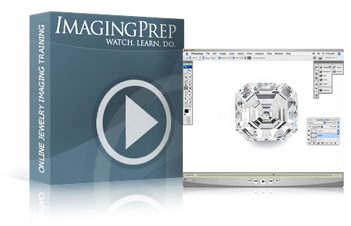 Loose diamond images are very valuable for any online or brick and mortar jewelry retailer or jewelry photographer. In this chapter, we use our finished, loose ascher cut diamond image, to replace round diamonds set in a basket stud setting, and “create” a new piece. Loose diamond images can be used for many purposes. This includes; engagement ring builder tools, diamond stud builders, and other solitaire and engagement jewelry lines offered with different shaped diamonds. How do you photograph colored diamonds? The process is very similar to regular diamonds. In this chapters lesson we cover the light setup for shooting colored diamonds, retouching the photograph, copying the image to create a composition, and manipulating the shadows in Photoshop to emulate natural shadows. 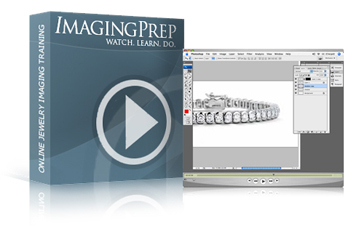 The lesson topics covered are: Lighting for photographing a diamond tennis bracelet, the camera setup, styling, and retouching the image in Photoshop. This is an excellent introduction to "creating" a shadow in Photoshop. 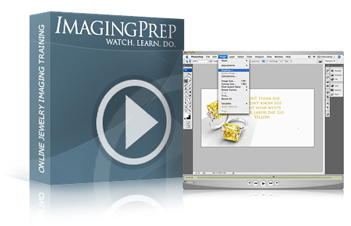 Part of prepping the image is to isolate, or "cut it out" from its original background. We then are able to apply dynamic shadows with character and direction to the photograph.